WVR5200 Compact Monitoring ideal for edit suite applications. WVR5200 Compliance Checking in Distribution or Broadcast applications. The WVR5200 Compact Video Waveform Rasterizer provides an ideal solution for basic video and audio (with Option AUD) monitoring needs in a convenient 1RU, half-rack, short-depth form factor, suitable for space-constrained environments. This versatile instrument can accept power from a 12 V DC source, a battery, or a 100-240 V AC converter. 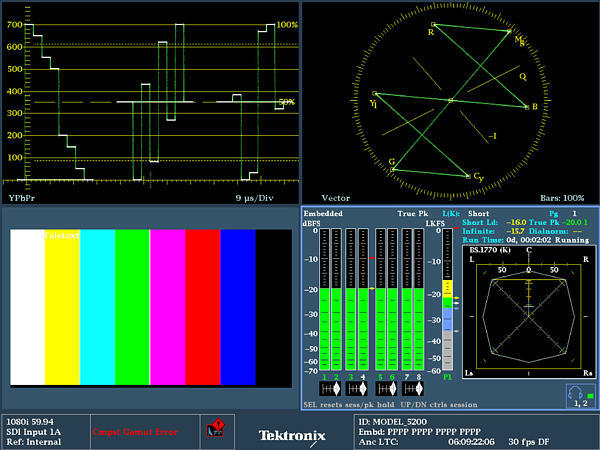 Optional audio monitoring support for 16 channels of Embedded AES/EBU Audio (Option AUD) provides a variety of audio level bar monitoring, multichannel surround sound display1 and flexible Lissajous display. A front-panel headphone port can be used for easy compliance verification of digital audio without the need for an additional piece of equipment. This instrument provides the reliability of the Tektronix waveform rasterizers family in a compact, basic monitoring product. The WVR5200 offers uncompromised monitoring quality with sharp CRT-like traces, patented Gamut displays, picture thumbnail, display freeze, and an error log for 10,000 events for efficient content compliance verification. The WVR5200 offers a variety of displays designed to show status at a glance, in addition to the status bar continually displayed at the bottom of the screen. Each of these displays offers user-selectable gamut thresholds so operators can set monitoring limits appropriate to their specific operation and include a preset for EBU-R103. 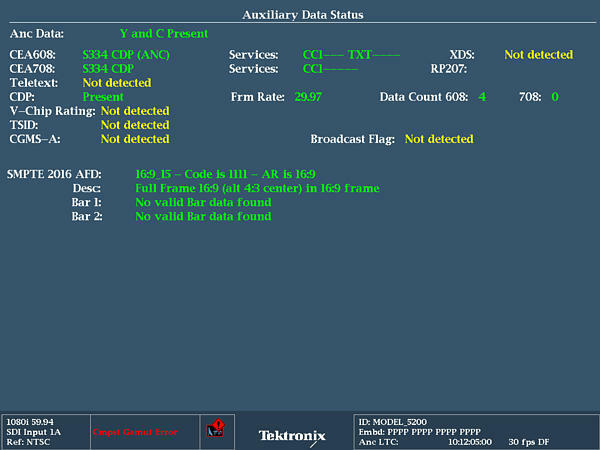 You can also select bright-up conditions to see the location of gamut errors on the Picture display. In addition, gamut monitoring is fully integrated with the powerful alarm logging and reporting capabilities of the WVR5200. 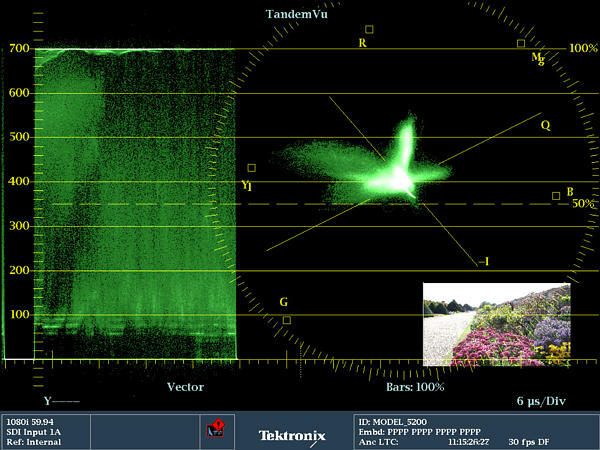 The WVR5200 also features new optional advanced color gamut monitoring capabilities (Option PROD) including the Tektronix-patented Luma Qualified Vector (LQV™) display and Spearhead display that, when used in conjunction with Tektronix proprietary Diamond and Split Diamond gamut displays, provide the most comprehensive color gamut monitoring tools available for precise color gamut adjustments. 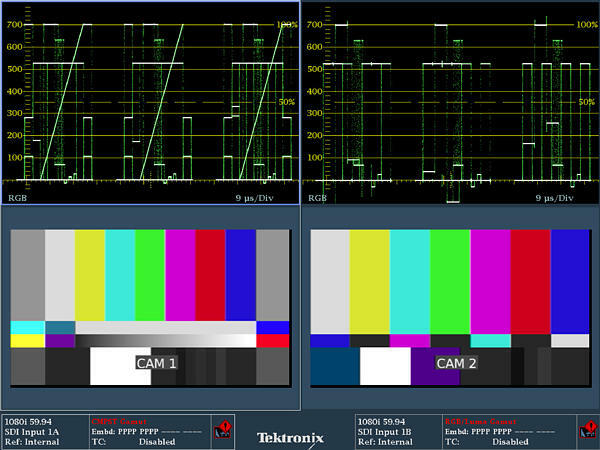 Two-channel Simultaneous Monitoring (Option CAM) is ideal for monitoring multiple camera inputs or comparison of incoming and outgoing transmission chains. The simple Simultaneous Input Monitoring (CAM) capability of the WVR5200 provides flexibility in monitoring multiple inputs. 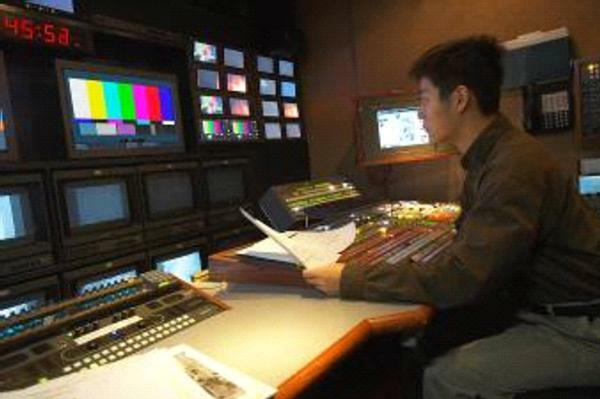 In mobile truck (OB van) applications this allows the operator to compare two different camera inputs with picture and waveform displays. This capability can also help operational staff quickly determine if a video quality problem existed in the input signal or arose in their facility. It enables engineering staff to quickly detect, diagnose, and resolve technical problems introduced in a piece of video equipment by comparing the input and output signals at each point in the chain. 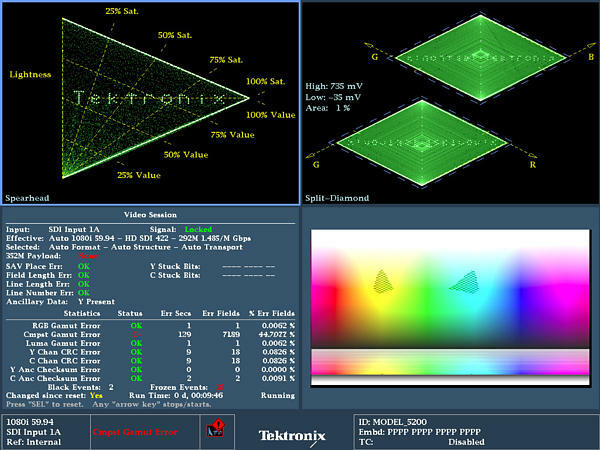 The new Tektronix-patented Quad Diamond display (Option S3D) simplifies stereoscopic camera alignment by showing a disparity histogram of the left and right signal from a signal level of 0 to 100% vertically for each of the components: Luma, Red, Green, and Blue. If the two cameras are well balanced, then the trace will form a vertical trace for each of the diamonds. 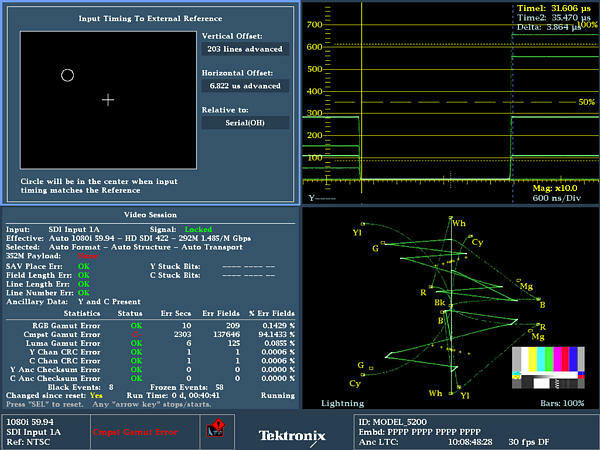 A deviation in the trace indicates an imbalance between the left and right eye images that should be corrected using the various camera controls until the trace becomes vertical. 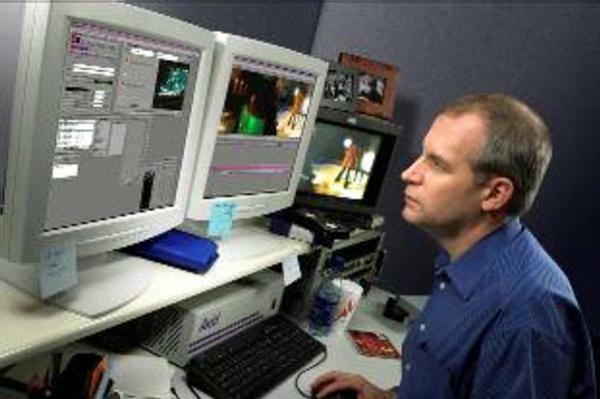 This display can also be used in post-production for aiding the editor and perform color correction on the left and right images. The WVR5200 (with Option AUD) provides high-quality digital filtering and oversampling to insure precise, reliable, and repeatable audio measurements. The instrument provides 16-channel embedded digital audio monitoring with Audio Bars, Lissajous Displays, Surround Display1, and a front-panel headphone port for easy compliance verification of digital audio without the need for an additional piece of equipment. Flexible mapping of the embedded audio inputs to the audio bar displays allows for a variety of audio mixes to be supported from multiple stereo signals to surround and stereo support. The Surround Sound1 display provides intuitive graphical representation of channel interaction in a surround sound system. The Bars display provides indication for faults, audio levels, and provides indication of the presence of a Dolby format. The flexible Lissajous display allows the selection of any two audio channels. 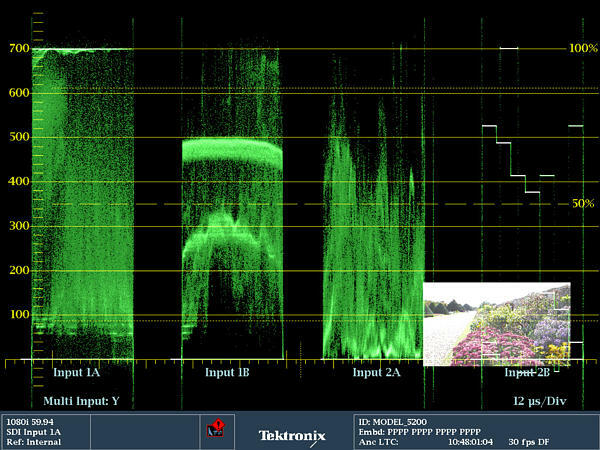 Specialized audio displays provide deeper inspection of the signal and make the WVR5200 instrument a comprehensive compact waveform and audio rasterizer. 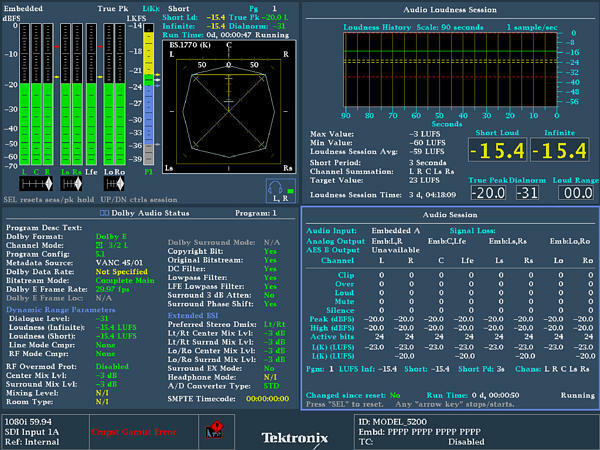 The audio session displays summarize levels, faults, and number of active bits for each channel. These instruments also feature Audio Control Packet Data and Channel Status displays. Today there is a wide array of metadata that provides information to a variety of equipment through the processing chain. 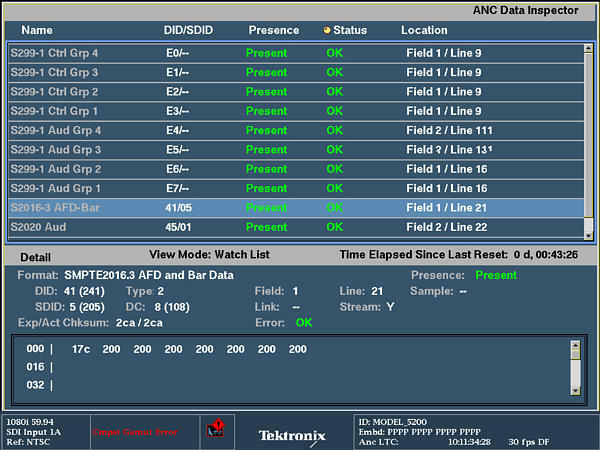 Monitoring of this metadata is critical to ensure that the processing equipment correctly handles the signal. 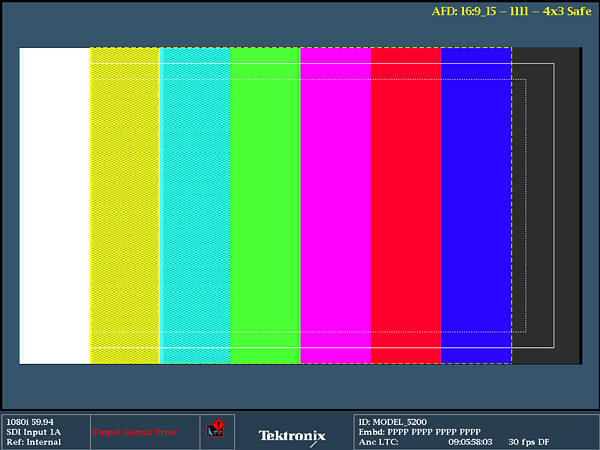 For instance, correct format of the AFD ensures that the aspect ratio on the display is correctly formatted and the automated AFD graticule is available for the Picture display of the WVR5200 along with the binary data and text description for easy monitoring. 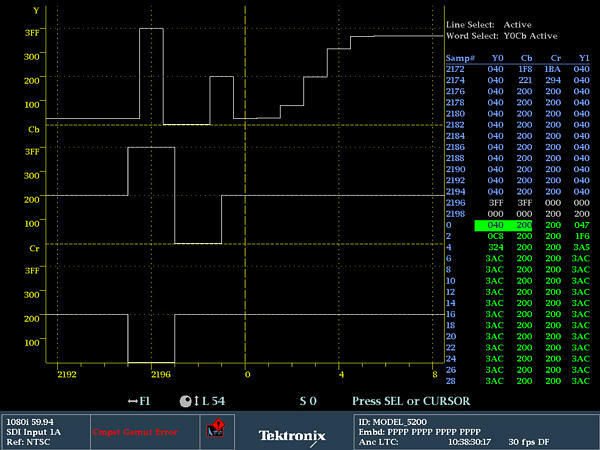 The WVR5200 waveform rasterizer accepts a wide variety of input signal formats and external references. The rasterizer will automatically detect the signal format and establish the appropriate settings for the various displays. Note: Please specify power plug when ordering.